Night Watchman 2 Million-Volt Stun Gun / LED Flashlight Combo Defense Tool - Orange Camo | BUDK.com - Knives & Swords At The Lowest Prices! 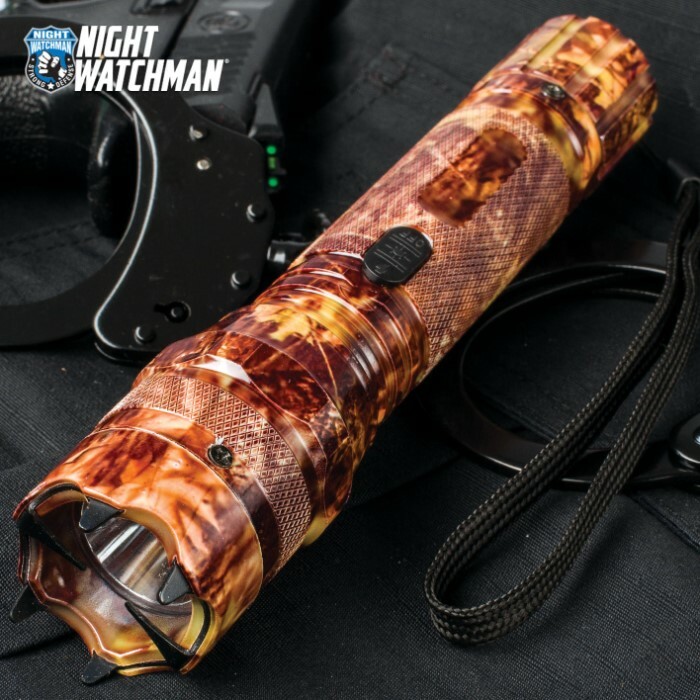 This versatile stun gun / flashlight combination defense tool from Night Watchman is one of the most powerful stun guns available on the civilian market today! It boasts 2 million volts of intense shock power - more than enough to incapacitate any would-be assailant. The extraordinarily bright 380-lumen LED flashlight is perfect for illuminating your way through dark parking lots or alleys and can even serve as a second defense option - when shined in eyes, the ultrabright beam temporarily blinds and disorients foes, allowing you to slip away unharmed. A handy wrist lanyard allows for convenient transport while walking or jogging, and the orange camo finish is both stylish and practical. CAUTION: This is a serious self-defense tool, and careless or improper use is dangerous. Its attacker-deterrent features should only be used in cases of lawful, justified self-defense or in defense of others. Before use, research your area’s stun gun regulations and familiarize yourself with safe operation procedures. Always obey all applicable local, state and Federal laws. The high-voltage stun gun produces a powerful shock, and exposure may cause severe pain, muscle contractions, physiologic stress, metabolic changes, and - in rare cases - moderate-to-severe injury including cardiac events. Discharging the stun gun in vulnerable areas like the face, eyes or near the heart increases the risk of serious harm. Treat the stun gun like a weapon and follow safe handling practices accordingly - always assume it is fully charged and capable of discharging and store in a safe, secure place out of the reach of children. The flashlight produces an intense 380-lumen beam, and direct eye exposure may result in significant, possibly irreversible harm, including but not limited to: corneal damage, permanent sight degradation or even blindness. Closer proximity and longer exposure times increase the risk of injury. Never look directly at illuminated LED; always be sure switch is in "off" position before changing batteries or inspecting LED, lens, stun gun prongs or housing. Never shine the flashlight directly into someone’s eyes, except in legitimate cases of self-defense. Had this product for almost a year works perfectly. Just looking to get and extra charger. Ordered one had it for a month and a half before the stun gun quit working only used once. Flashlight is ok but if you shop around, can get a better deal for bright flashlight. first of all this stun gun is very powerful. the flashlight is also very bright. It is easy to operate, and even easier to charge. Just the simple fact that you get a bright flashlight that doesn't need batteries is reason enough to buy this product, and the extremely powerful stun gun on the end is a very nice bonus.